Single site located between junctions on one side of the motorway. Roadchef's half of the split services, for southbound traffic. The service area is a bit more modern than its northbound counterpart, and it's bigger too. First two hours free for all vehicles, after which cars must pay £12 and HGVs, caravans and coaches £24, or £26 to include a £10 food voucher. Prices are paid using PayByPhone - more details or in the shop or restaurant. The location code is 5268. The old entrance to the services. Struggling to strike a balance between not opening enough services for traffic to rest, and opening up so many services they would struggle to make any money, the Department for Transport suggested a car park and toilets only be built at Brent Knoll. 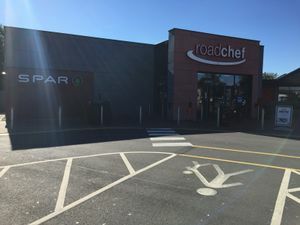 To combat problems with crime, Roadchef (the owners of the next services south, Taunton Deane) were invited to set up a small catering facility and seating area on the southbound side, which later became the full Sedgemoor service area that's here today. Chester is the only other service area to have been developed this way. Today, the idea of rest areas is being strongly considered and they may well become a common sight on the motorway. The temporary arrangements during the refurbishment. During late 2015 and early 2016, a large extension was built to near enough double the size of the amenity building. The Costa café was refurbished and reopened in early January 2016 with a McDonald's restaurant opening in late January 2016. Chozen Noodle and Fresh Food Café opened in late March 2016. A Spar store opened in June 2016 with the WHSmith store also having been refurbished. During the building work, a temporary seating area was placed at the front of the former entrance to the services in the form of a gazebo tent. Planning permission for a Costa Drive Thru here was granted in late 2017 and the drive thru opened on 27 June 2018 sitting adjacent to the motorway upon entering the services.